There are certain best practices that should always be followed when integrating third-party extensions into a Magento store. The Magento marketplace has several third-party extensions for adding additional features to your eCommerce store. The third-party extensions involve adding multiple users to the store, managing coupons, integrating multiple payment gateways, adding security seals, and more. However, there are certain best practices that should always be followed when integrating third-party extensions into a Magento store. These best practices help you reduce the number of bugs and enhance the quality and maintenance of your extensions. So, go through the list of the following five best practices that will help you address the common third-party extension issues and ensure the smooth functioning of your Magento store. Define a set of guidelines or coding standards that describe the style of writing your code. Whether you are a Magento development services provider or a solo developer, following the coding standards that you establish will make your code maintainable and consistent. Ensure that your Magento coding standards are based on Zend coding standards, PSR2, and PSR4. Code redundancy is difficult to maintain, so avoid copying and pasting your code throughout the application. Instead, write a code or create a single class that you can refer to when needed. The code should be small and focused and provide a general solution so that it can be reused for future development. Also, ensure that you reuse your code as much as possible in order to avoid the costs of duplication. Designing a replaceable code is as essential as making it reusable. By designing a replaceable code, you make it modular and loosely coupled, consequently enabling improvements and easy updates in the future. It must be a common practice to replace your existing codebase with newer and better code pieces as the new bugs are tracked or new strategies become available. Helper or utility classes are classes that have static methods that do not fit anywhere else. These classes are antipattern and work against the object-oriented programming principles. A helper class that works as a catch-all for the random methods breaks the single responsibility principle as it attempts to solve multiple issues in a single class. For instance, if you have created ClassA and ClassAHelper using static functions that work on ClassA, then consider refactoring those functions into ClassA. You must maintain consistency while naming conventions for files, folders, methods, and classes. By following the standard conventions, you give your code a professional look while making it easier to read. Not following this practice can violate the code standards and impact the maintainability and readability of your extensions. 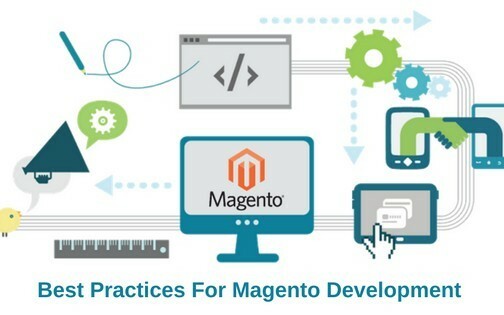 These are just some of the best practices that a Magento developer can follow. There can be numerous more best practices to ensure a bug-free and stable Magento experience. Let us know your opinions regarding these best practices in the comments below.